Smells like the 90s is back for 2019! 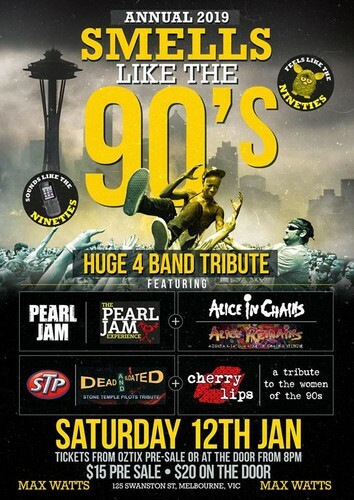 The annual tribute to the great rock music of the 90s will be happening on January 12th. With 4 bands on the bill paying tribute to Pearl Jam, Alice in Chains, the women of the 90s and Stone Temple Pilots, and in-between sets music playing all the rest of the 90s, this will be a huge night. Doors open at 8pm and the first band will be on straight away so make sure you get there early. This is gonna be nuts.